How to clean your horses' stalls efficiently. When it comes to cleaning stalls, it’s not rocket science. But any time you’re dealing with the health and comfort of your horse, you’ll want to make sure to do the best job possible. If you can do it faster and easier, that’s even better. To find out how the experts make short work of cleaning stalls, we turned to the Kentucky Horse Park in Lexington, Ky., home of the Rolex Kentucky Three-Day Event and site of the 2010 World Equestrian Games. 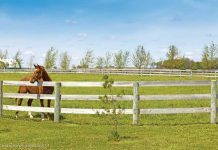 The Kentucky Horse Park also offers several different programs, including one on equine management where aspiring equine professionals learn about horse and barn management, equitation and more. 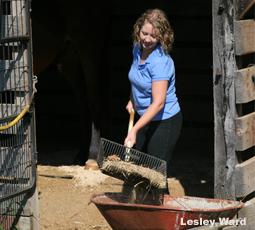 Ellen Hamilton, equine science instructor at the Kentucky Horse Park, shared the park’s stall cleaning routine. She notes that whether the stall is bedded with straw or shavings, the same cleaning method is used. Stall floors are either concrete or rubber mats, depending on the barn. Once the clean bedding is out of the way, the manure and dirty bedding are raked out of the stall and placed in a manure spreader in the barn shedrow. A shovel is used to pick up any material that falls through the fork, and the center of the stall is then swept clean with a broom. Any damp spots are treated with an absorbent deodorizer, usually available at a local feed store. The stall is left to air out and dry completely, with bedding pushed back against the walls, until just before horses are brought inside in the afternoon. At that point, the remaining clean bedding that was against the walls is spread over the stall floor, and new bedding is added, if needed. The Kentucky Horse Park has larger-than-standard stalls that are 16×16-feet or 14×16-feet. Even so, by following their regime, Hamilton says cleaning usually doesn’t take longer than 10 minutes per stall. Hamilton likes to leave horses outside as long as possible before bringing them back into their stalls. For horses who have to stay in, stalls are cleaned thoroughly in the morning and then picked through again in the mid-morning, afternoon and evening. 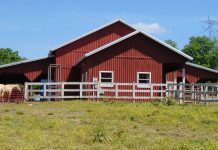 This is especially important if you have a horse that likes to walk through his manure, which grinds it into the bedding and often means the entire stall must be stripped. The right tools make any job easier, and stall cleaning is no exception. If you bed with straw or bedding hay, you’ll want a pitchfork. If you use shavings or wood pellet bedding, a bedding fork with tines that are close together is essential. A leaf rake and stiff broom will also come in handy, and of course, you need a muck bucket or wheelbarrow to take the used bedding and manure out of the barn. The type of bedding you use has a lot to do with how fast you can clean your stall. Manure often “gets lost” in straw and bedding hay, falling under the top layer. Shavings and wood pellet bedding are easier to sift through with your fork. Your horse’s “personal hygiene” habits will also impact the ease and speed of stall cleaning. You’re in luck if you happen to have a fastidious horse that makes one concentrated manure pile in the corner and one urine spot in another location. With a neat horse, you can often get away with cleaning the stall once a day. Of course, many horses aren’t that tidy and will simply go wherever they happen to be standing. 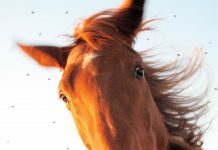 If they’re also the type that likes to walk through their piles, then you’ll definitely want to clean the stall twice a day, typically morning and evening. Another quick “pick through” sometime mid-day can help save time and bedding. Keep in mind that horses are meant to live outside and were designed to roam miles each day, eating for as long as 18 hours a day. Shutting them up in a stall goes directly against their nature, so whenever possible, do your horse a favor and turn him out. You’ll have a cleaner stall…and a happier horse. Toss clean, unsoiled bedding against the walls and into back corners. Toss manure and dirty, wet bedding into center of the stall or directly into a muck bucket or wheelbarrow. Rake out center of the stall. Sweep the center of the stall thoroughly and pick up any remaining dirty material with a shovel. Sprinkle absorbent deodorizer on any wet spots. Leave the empty stall to air dry with bedding pushed back as long as possible until you need to bring the horse back inside. Pull clean bedding back into the center of the stall, add new bedding if needed, and fluff the whole stall with a fork. Bring your horse inside and just watch…he’s sure to “christen” his newly-cleaned stall shortly! Great article. I am printing this and posting it at the barn! I am surprised that automatic bedding sifters are not mentioned in this article. Ammonia gas from urine causes respiratory problems by forming ammonium hydroxide, a caustic base, in the lungs and bronchial tubes when it comes in contact with moisture on the tissues that line them. Daily removal of urine-saturated bedding is necessary to maintain peak respiratory function. It is easier to prevent fly breeding than to control adult flies. Eliminating the habitat required by the larvae to hatch and grow significantly reduces fly populations. Stalls that are dusty can cause allergy and respiratory problems. Rubber mats provide a measure of padding and insulation and are impermeable to urine, which is absorbed by the bedding. The wet spot must be removed daily. The manual method has been the common method of stall cleaning for many years and if done well by an experienced worker produces an acceptably clean looking stall but up to 25% of manure bits are left in the bedding. Hand picking is arbitrary and in order to save time or avoid pain, the cleaner often throws good bedding away with waste. Time can be saved at the expense of bedding or bedding can be saved at the expense of time. Neither case makes good business sense in the long run. Additionally, the waste stream can be doubled by the inclusion of bedding that could have been recycled using the automatic method, discussed below. Automatic Sifting is The best way to clean a horse stall. Automatic sifting is an efficient and economical stall cleaning method with an almost perfect end result. All manure larger than a kernel of corn is removed in less than half the time for manual picking. The Brockwood Stall Shi*fter is the first and most reliable automatic manure and bedding sifter on the market today. It can be seen at http://www.brockwoodfarm.com. I’m one of the lucky ones who has an uber neat horse. She does both eliminations in a back corner and does not walk through it at all. It still takes me about twenty minutes to clean her stall, which includes walking out and getting fresh shavings, carting them back and arranging them. I really enjoyed understanding step by step how stall cleaning is done at the Kentucky horse park, however as a barn owner of a mid sized stable in Oregon, I would go broke if I had to pay my workers for that kind of tedious job. Our horses are turned out all day and we use shavings or pelleted sawdust bedding. A commenter mentions using a automatic sifting unit as a a better alternative and this is definitely a great idea. There are issues with using auto sifting units however, such as: they are big and cumbersome, require a plug in are going to be too large to use effectively in the average 12×12 stall, etc. This is where one would think a hand tool to be much more useful! For those of you who have not seen it – the Berto Shake’n Fork is the answer! It is a power sifting manure fork, that requires no cords, is light weight and does the job quick easy and fast. Plus the tines on the fork are nearly indestructible! The Shake’n Fork is a neat little device but not built for the same level of stall cleaning that the Brockwood Stall Shi*fter is suited for. The Shaken fork will do the same job that any other fine tine fork will do but do it faster. It will not clean a stall as thoroughly as the Brockwood Stall Shi*fter. The Stall Shi*fter will thoroughly clean a 12 x 12 stall bedded about 3 inches deep in 5 to 6 minutes and will remove every particle larger than a kernel of corn; the Shake’n Fork , as good as it is, won’t do that. A Shake’n Fork is an excellent tool if you just want to quickly pick the obvious piles but a Stall Shi*fter completely aerates all the bedding passing through the screen. There are hundreds satisfied Shi*fter users who would disagree with Joy about the big and cumbersome part. A Stall Shi*fter will not only remove every piece of manure larger than a kernel of field corn it will reduce bedding usage by average of 50 percent and time to completely clean, refresh and re-spread the stall by 60%. The palms down labor of shaking a manure fork aggravates tennis elbow the palms up labor of simply scooping the manure and bedding with a shovel and putting it on the shaking screen does not. If you are like Xena from Dawson Creek, BC and are interested in doing a thorough job for the least amount of labor and bedding usage and have tennis elbow you will appreciate the Brockwood Stall Shi*fter. It is in a class by itself. Is there any equipment that be purchased to ease the back burden of cleaning the stalls other than a bobcat? My horses think I am their personal maid, I will have to read this article to them and I bet they will laugh. But it sounds like cleaning will be fun. I wonder if this will also work for house work!!! Good article, but I do things a bit differently. I get the scooper and wheelbarrow ready and start at the back of the stall, scooping up all manure piles and bits I find for about a 1 foot strip. Then I scrape everything away from the wall so there is a 2-foot strip of mat showing through. If wet spots anywhere in the stall, I remove completely before moving the area. Then I work my way toward the stall front until about 1 foot away. I follow the same steps as the back end, then check to make sure everything is clean. Once all dirty shavings and waste is removed, I push all shavings up against the sides to allow wet spots on the mat to dry. I go on to finish all the other stalls like that, then go back and spread out remaining shavings and add more as needed to each stall. I get fully done with 8 12×12 stalls in about 1hr30min, including up to 4 trips out to manure pile to dump the wheelbarrow, with this habit.